All automobiles shown in our Customer's Car Show pages are equipped with our products. Photos and information submitted came directly from our loyal customers. We thank you for participating and all of your cars are trophy-winners in our book! If you would like to submit photos of your vehicle (we also equip trailers and motorcycle trikes) please click on this link and send us some photos and descriptions. We have the best customers on Earth! Thanks a million! "BEST of SHOW!". Mr. Larry Wescott of Spanaway, Washington sent us this photograph of his show-stopping and show-winning 1956 Chevrolet Bel Air. 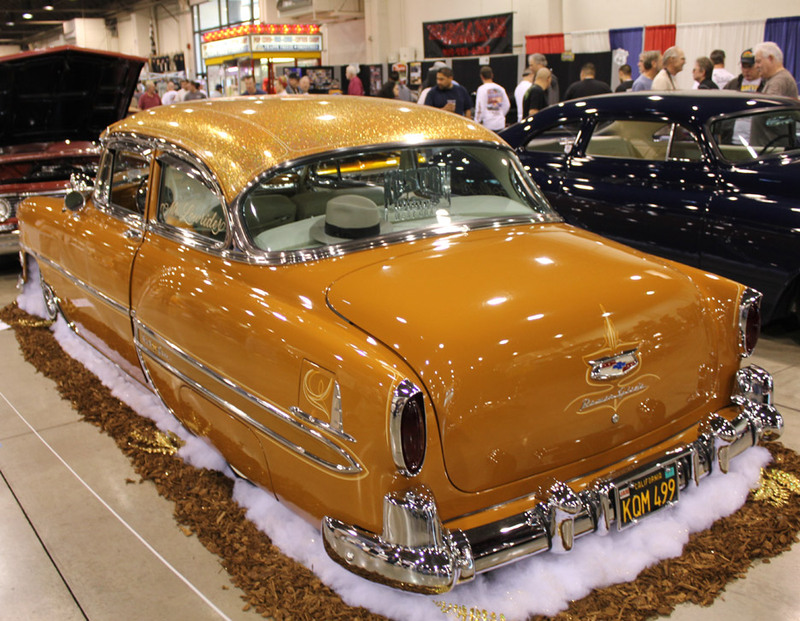 Mr. Wescott tells us, "Here is my finished 1956 Chev Bel Air picture I said I would send. First show with my new wheels and center caps I got best of show. The show only had about 200 cars but the best part it was voted on by all the car owners. Thanks again. Larry Wescott". We can't take credit for Mr. Wescott's big win but we strongly believe that a set of wire wheels on a highly detailed car like this one are certain to capture those precious extra points on the Judge's scorecards. This is proof of it. My name is Ed Eure. This is my 1956 Chevy 210 2 door sedan. We put a set of your wire wheels on it and absolutely love them. Chevrolet Nomad runs 50-spoke Truespoke Wire Wheels and 3-Blade spinner caps. The wheels and tires were delivered today they look great. Dads reaction when he saw them was OH WOW! If the attached picture is acceptable feel free to put it on your website. 1936 Chevrolet Pick-up. Owner: Mr. Allen Carpenter. The wheels are our Hot Rod style with 52 spokes powder-coated black. Please click here for more information. Mr. Harry Wolstenholme sent us these photos of his 1976 Corvette. The wheels are no longer in production. They were our "FAT WIRES". They had 30-spokes. Sadly, they are no longer available and Harry got our last set in his size. Fantastic 'Vette and wheels. Mr. Anthony Romero runs our Chevrolet 56-spoke Kelsey Hayes style wire wheels with the 3-bladed spinner cap. This elegant convertible has won many car shows and specialty trophies. The wheel size is 15 X 6". Smaller and larger sizes are available upon special order. Please click here for our Chevrolet wire wheel information. Mr. Louis Laib restored and built this Cameo show-truck using our Chrysler style wheels with gold-plated hub caps to match the other gold plated trim pieces he selected. Check out all the trophies in the window of Mr. Laib's Philadelphia home which is over 110 years old. His grandfather built the home and Mr. Laib was born there! 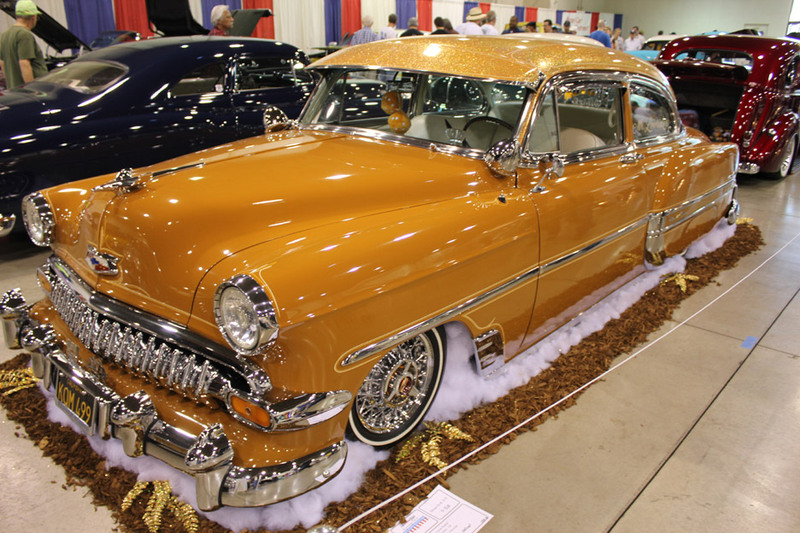 Mr. Eddie L. Hatfield of West Virginia performed a frame-off restoration on this very eye-catching '55 Chevrolet Bel Air. It runs a 350 cubic inch engine with a 4-speed. Mr. Hatfield added a Vintage air system, tilt wheel, disc brakes and an aluminum radiator among many upgrades. For wheels, we built up a set of custom 15 X 7" 56 spoke wheels with Chevy spinner caps. The tires are BFG red lines. A 7" width is very tight for a '55 and required some shoe-horning but the owner is pleased with the result. 1958 Chevrolet Impala - Owner: Mr. Anthony Romero of Southern California. Wheels by Motorspot, Inc. Here are a few pictures of my '62 Corvette with the Truespokes installed. The color of the Corvette is a special extra white metallic. 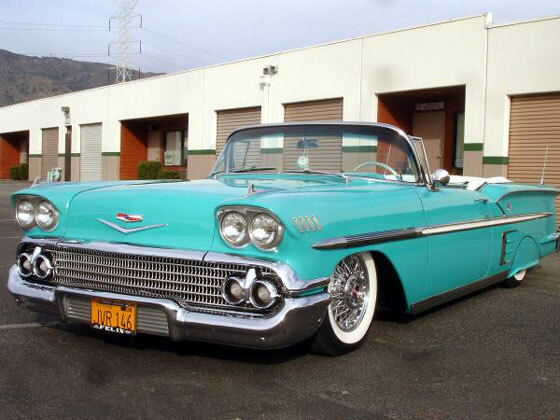 Dr. Steven Alvarez Mott owns this stellar 1958 Chevrolet Impala convertible. 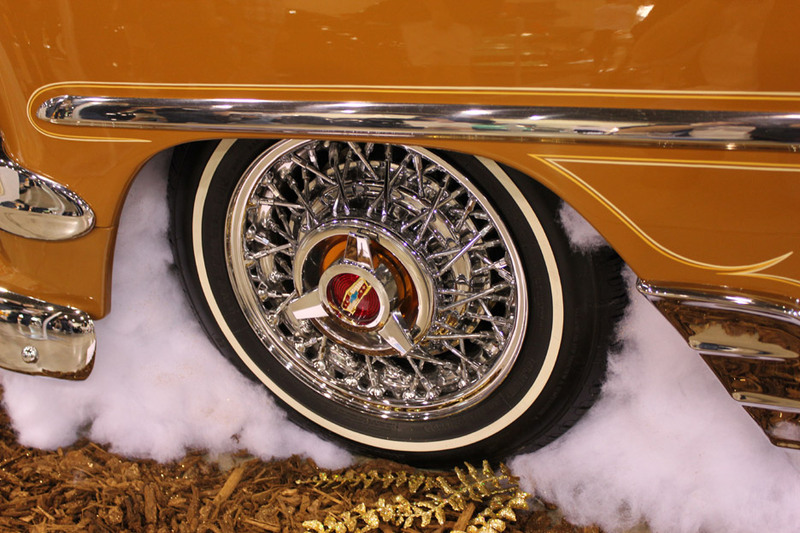 The custom built wire wheels have a high offset to clear the rear fender skirts. This California convertible is one sweet ride. This mild-kustom 1963 Nova station wagon uses our 14 X 5.5" custom, lip-lace wire wheels. The hub caps are our 3-bladed spinners with Chevrolet emblems. This very pleasing wagon is being built by Wheels Unlimited in Japan who also are a Truespoke dealer. Master-builder Kyohei tells us: "I attached the pictures of the 1963 Chevy Nova Wagon I recently painted pearl cream. We put in an Air Ride system with 4 Link suspension and your special built 14x5.5 Lip Laced Chevy Wire Wheels. Thanks, Kyohei"
Tom and Shirley Foxwell of Snow Hill, Maryland own this immaculate Chevrolet Cameo. Breaking with tradition, the Foxwells selected our 56 spoke Chevy wheels with the three bladed spinner. The American Classic narrow whitewalls are another excellent choice. 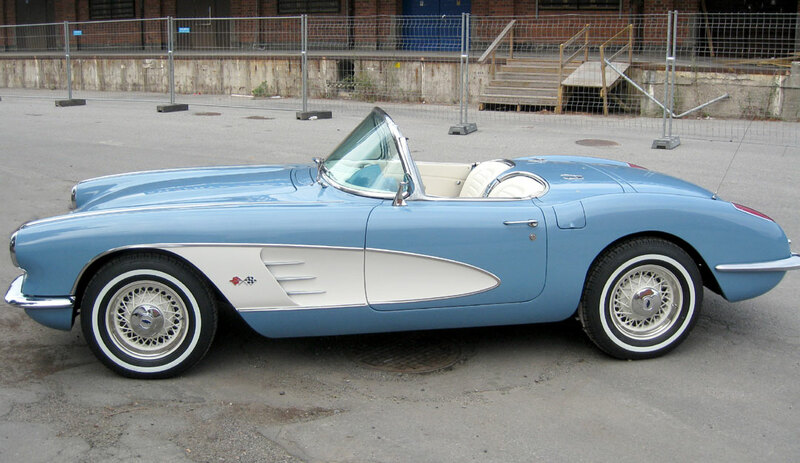 1959 Corvette - Owner: Mr. Daniel Eriksson - I just wanted to thank you for being really pleasant and professional to deal with.